BRUMCON 2 the 1965 UK National Science Fiction Convention - the seventh to be run under the aupices of the B.S.F.A. - took place over the weekend of Friday, April 16th to Monday, April 19th. It was held at the Midland Hotel in Birmingham, and Guest of Honour was Harry Harrison. In SKYRACK, Ron Bennett reported that: "About seventy fans and professionals attended the Con at the Midland Hotel, New Street, and whilst it was an enjoyable weekend, it was not the most memorable of conventions. Undoubtedly the attendance, small for recent years, was overshadowed by the forthcoming World Convention in August." 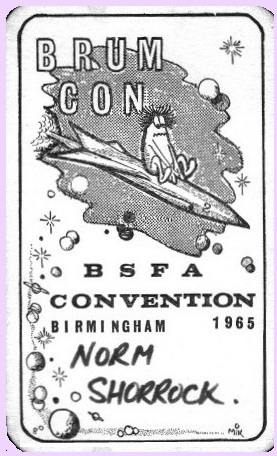 By calling their con BRUMCON 2 (as it's referred to in convention literature, if not on the badge), the Birmingham Group retroactively made the previously unnamed 1959 Eastercon 'BRUMCON', which is how it now appears in convention listings. The Midland Hotel later served as the venue for British FANTASYCONs for a number of years. This is what the reception area looked like circa the late 1980s. Report below edited together from those written by Charlie Winstone, Mike Higgs, Beryl Henley, Archie Mercer, Peter Weston, and Ron Bennett. Comments by me appear in parentheses and are italicised. Editorial note: Mercer and Henley wrote about themselves in the third person in their joint report. In the composite report below, their contributions have been attributed to each individually and first person substituted for the sake of consistency. Source notes and links to complete, unedited versions of those reports can be found here. The photos presented herein come from a variety of collections, though this doesn't mean a particular picture was taken by that person. The collection photos are from, where known, is noted in parentheses thus: (ks) Ken Slater, (ns) Norman Shorrock, (dk) Dave Kyle, (jg) unknown. As always, a tip of the hat to Peter Weston for identifying many of the people in these photos and for supplying them in the first place. Here are links to pages devoted to the individual days and to convention literature. Note: Events at this convention also led to a proposed edition of THE ENCHANTED DUPLICATOR being aborted. The full story is covered on this page. It all started some fifteen months ago, - the Brummies, in a fit of derring-do, talked Ken Cheslin into standing up and calling for the 1965 Convention venue to be Birmingham. This he did, not without some misgivings. After all the British Science-Fiction Association's Committee was also centred upon Birmingham. Still, there were plenty of Brummies (Easter Brummies, as they were christened by Archie Mercer) around - it was surely not an impossible task to put on a Convention. 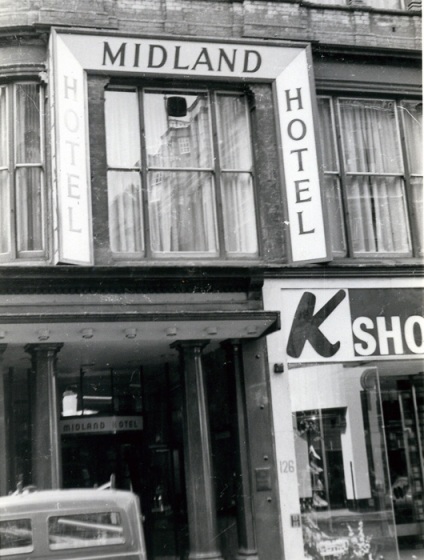 As months went by the frenzy grew, in June 1964, came and went, the Hotel was booked. The Film Show programme was suddenly decided upon in September October and November and the films themselves were ordered at the last minute, in January. After long, two hour debates over the last two months of 1964, the Convention Committee gradually thrashed out a kind of programme. The Convention Committee, incidentally, were made up of the three resident B.S.F.A. Committee members ie. Ken Cheslin, Roger Peyton and Charles Winstone plus Mike Higgs (alias MiK) and Cynthia Grant. Anyway, the frantic pace carried on, (in between B.S.F.A. meetings) - the Convention Journal was issued ('Brumble' - see above) at sporadic intervals. Four of them - each one a fanzine in its own right. Came the last two months, and it was discovered that the Hotel decorations were not started, neither, except for a few items, was the Convention Booklet. So, MiK's arms were twisted, unravelled, and he was forced into a short spell of slavery. For night after day he slaved, on sketches and stencil. He was dashing from Ken Cheslin, back to his board and back to Ken again. It seemed that the badges etc. would be late for the Convention as well as the programme booklet. Then on the last Sunday before the Convention, there was a mass meeting of the Brummies at MiKs Mansion. The horde rushed into his house (between three and four o'clock in the afternoon) and waited to be told what to do. Mik arrived and soon got things organised. Soon the Booklets were collated and stapled. In the front bay-window, two figures huddled over a pile of cards, pins and tape. (The badges were being manufactured). An indian file of figures scuttled around in a circle in the front room, picking up and putting down sheets of paper. Two figures crouched over the infernal machine that is the stapler, taking it in turn to thump it. (Birmingham has the only steel-staple tipped fingered fans in fandom). In the living room and the kitchen stood two or three immobile figures, lost in contemplation of a large sheet of paper pinned to the wall. MiK stood in front of the paper, pondering upon the subject that was to be hung in the Convention Hall. Time passed, with but four days to go to the Convention, it was getting rather urgent that something should be drawn and painted. MiK's painted backdrop. Cliff Teague talking to small girl, Roger Peyton at far right. (dp). Finally, in a burst of bewildering creative frenzy, MiK attacked the tauntingly blank sheet of paper. Gradually, a shape took shape, the outline grew and then the sword was drawn. One of the Brummies (Cliff Teague) was persuaded to sit cross-legged on the floor, so that the picture could be drawn from life. MiK delegated the job of painting in the large areas of colour to a Brummie, and then drew some smaller pictures for the other Brummies to work on. Ten o'clock, and then Brummies had gradually drifted away. MiK arranged for one or two to turn up and continue the work the next day, and soon he was alone with Cynthia. 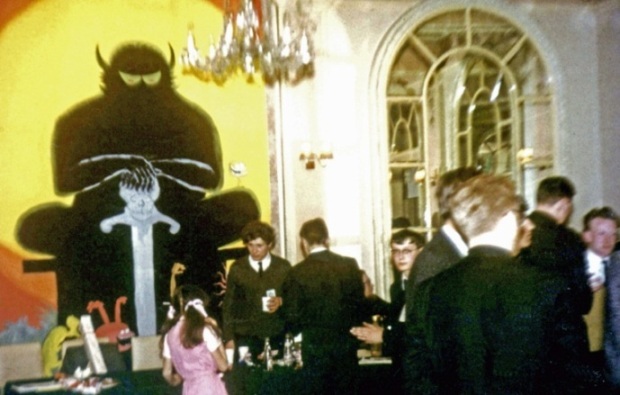 Came Thursday, and Friday, and the Brummies trickled into the Hotel and so the decorations continued - splashes of paint on paper all night, then on Friday evening it was all done (nearly) and the stage was set, for the Brumcon 2 Convention of 1965.